Except our shoes don't send microwaves directly into our brains. And cell phones do—a fact that has increasingly alarmed the rest of the world. Consider, for instance, the following headlines that have appeared in highly reputable international newspapers and journals over the past few years. From summer 2006, in the Hamburg Morgenpost: ARE WE TELEPHONING OURSELVES TO DEATH? That fall, in the Danish journal Dagens Medicin:MOBILE PHONES AFFECT THE BRAIN'S METABOLISM. December 2007, from Agence France-Presse: ISRAELI STUDY SAYS REGULAR MOBILE USE INCREASES TUMOUR RISK. January 2008, in London's Independent: MOBILE PHONE RADIATION WRECKS YOUR SLEEP. 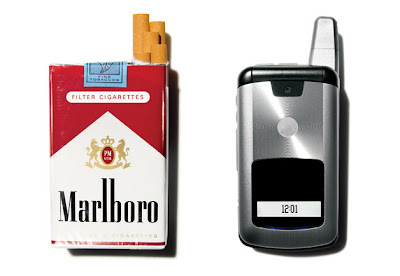 September 2008, in Australia's The Age: SCIENTISTS WARN OF MOBILE PHONE CANCER RISK. Though the scientific debate is heated and far from resolved, there are multiple reports, mostly out of Europe's premier research institutions, of cell-phone and PDA use being linked to "brain aging," brain damage, early-onset Alz heimer's, senility, DNA damage, and even sperm die-offs (many men, after all, keep their cell phones in their pants pockets or attached at the hip). In September 2007, the European Union's environmental watchdog, the European Environment Agency, warned that cell-phone technology "could lead to a health crisis similar to those caused by asbestos, smoking, and lead in petrol." The waves that Frey was concerned with were those emitted from the nonionizing part of the EM spectrum—the part that scientists always assumed could do no outright biological damage. When Frey began his research, it was assumed that the only way microwaves could have a damaging biological effect was if you increased the power of their signals and concentrated them like sword points—to the level where they could cook ﬂesh. In 1967, this resulted in the first popular microwave oven, which employed microwave frequencies at very high power, concentrated and contained in a metal box. Aside from this engineered thermal effect, the signals were assumed to be safe. Frey observed two factors in how microwaves at low power could affect living systems. First, there was the carrier wave: a frequency of 1,900 megahertz, for example, the same frequency of many cell phones today. Then there was the data placed on the carrier wave—in the case of cell phones, this would be the sounds, words, and pictures that travel along it. When you add information to a carrier wave, it embeds a second signal—a second frequency—within the carrier wave. This is known as modulation. A carrier wave can support any number of modulations, even those that match the extra-low frequencies at which the brain operates (between eight and twenty hertz). It was modulation, Frey discovered, that induced the widest variety of biological effects. But how this happened, on a neuronal level, he didn't yet understand. The cell-phone industry has managed to exert its influence in other ways, too. In the United States, the organization most influential in the government's setting of standards for microwave exposure is the Institute of Electrical and Electronics Engineers (IEEE), which bills itself as "a leading authority on areas ranging from aerospace systems, computers, and telecommunications to biomedical engineering, electric power, and consumer electronics." According to Slesin, "The committees setting the EM safety levels at the IEEE historically have been dominated by representatives from the military, companies like Raytheon and GE, the telecom companies, and now the cell-phone industry. It is basically a Trojan horse for the private sector to dictate public policy." The IEEE's "safe limits" for microwave exposure are considerably higher than what they should be, says Allan Frey, who was a member of the organization in the '70s. "When it comes to this matter, the IEEE is a charade," Frey told me. If all this sounds like some abandoned X-Files script, consider the history of suppression of evidence in the major issues of consumer health over the past half century. Big Tobacco hid the dangers of smoking and the addictiveness of nicotine, supporting its position with countless deceptive studies. Asbestos manufacturers hid evidence that the mineral was dangerous even as tens of thousands of workers died from exposure; the makers ofDDT and Agent Orange stood behind their products even as it became clear that the herbicides caused cancer. That the cell-phone industry, which last year posted revenues in the hundreds of billions of dollars, has an incentive to shut down research showing the dangers of cell-phone use is not a radical notion. When President Bill Clinton signed the TCA into law in February 1996, the rollout of "personal communication services," marketed as PCS, was in full swing. By the end of the year, telecom companies had paid the federal government more than $8 billion to purchase portions of the microwave-frequency sequence. (According to theFCC, fees paid for allocation of spectrum as of 2009 amounted to $52 billion.) Almost immediately, cell-phone antennas sprang up across the country, appearing on church steeples and apartment buildings, in parks and along highways, on streetlights and clock towers and flagpoles. One industry estimate tallied 19,850 such installations in the U.S. in 1995. Today there are 247,000, most hosting multiple antennas. Later, after Frey and I parted, I walked around Annapolis and took note of the number of cell towers poised atop the buildings, the number of people who talked on their cell phones. They were everywhere, and after a while I stopped counting. At one point, I watched two women pacing in a parking lot, heads bent against their microwave transmitters. They talked and talked and aimlessly circled. When I got home, I looked up a line from Orwell that I couldn't quite remember as I watched them, about the power that machine technology would exert over mankind. "The machine has got to be accepted, but it is probably better to accept it rather as one accepts a drug—that is, grudgingly and suspiciously," Orwell wrote. "Like a drug, the machine is useful, dangerous and habit-forming. The oftener one surrenders to it the tighter its grip becomes."